Ethnic dance is any dance form which can be identified as originating with an ethnic culture and expressing the movement aesthetics of that culture. Folk dance requires not only an ethnic identification, but a participatory and aesthetic tradition. Ethnic Folk Dance may be defined as dance that is an integral and anticipated behavior in a culture and is defined by the aesthetics of that culture whether rural or urban. Members of the folk dance tradition would include village dances, national dances, ritual dances, social dances, and educational dances. 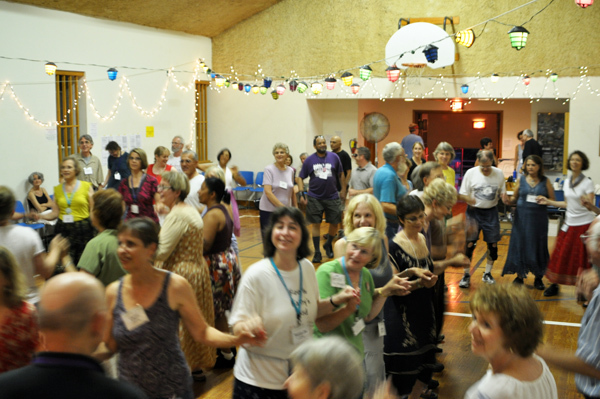 The best Ethnic Folk Dance Parties happen at the Door County Folk Festival! There are parties every night. Each night of the Festival features fun-filled parties with live & recorded music. On Wednesday through Saturday, George Davis and Forrest Johnson will be organizing DJs from among the various regional groups to play your recorded music requests. On Friday and Saturday, the orchestra Balkana (Chicago, IL) will provide sets of live music for the evening Dance Parties. For Dancers who also enjoy Contras & Squares, there will be brief sets of Contras and Squares at the Friday Party. At the end of the Festival, join us at the Survivors' Ethnic Folk Dance Partywhere Melissa Boutell will do her masterful job as DJ as she plays your recorded music requests. Recorded music requests are scheduled by the participants in a spontaneous, unstructured event that tends toward the anarchistic and chaortic*.